Square’s early success in mobile payments is prompting older and bigger competitors to double down on their efforts and utilize their natural assets in an attempt to eat into the startup’s growth. Companies like Intuit (s intu), PayPal (s ebay) and VeriFone (s pay)are emphasizing their scale, existing tools and business know how to appeal to small business owners who are increasingly looking for a mobile payment option. Intuit, for example, has been linking its GoPayment mobile payment service to its QuickBooks Online accounting software, making it easier for its 8 million existing software customers to go mobile. Now, it’s taking another key step by integrating its QuickBooks Point of Sale product with GoPayment. That means that the 200,000 customers who use QuickBooks POS hardware and software will have an easy way to combine a traditional POS experience with a mobile payment service. For business customers who take advantage of this combo, that means they can have workers taking payments in the aisles of stores or out at trade shows or events, with all the transaction data, inventory and analytics handled by one system on the back end. The mobile app can be populated with inventory items pulled automatically from QuickBooks Point of Sale. By offering both options, Intuit gives companies more flexibility to grow from a simple mobile-only retailer to a bigger storefront merchant. Between QuickBooks POS and GoPayment, Intuit is currently processing $6 billion annually and reaching 23 million consumers, the company said. Trevor Dryer, Intuit’s Head of Product Management, Mobile Payments & Point of Sale, told me Square and its Square iPad register are appealing products for very small businesses and merchants getting started. But he said as businesses start to grow with more inventory, employees and more locations, they’re looking for a bigger system to handle not just payments but the entire suite of services including demand generation, engagement, loyalty, inventory, analytics, accounting and other needs. Dryer said QuickBooks Point of Sale and GoPayment offers a more robust set of features including traditional hardware such as a barcode scanner, barcode tag printer, receipt printer, credit card reader and cash drawer. Intuit’s system can handle thousands of inventory items and has better options for grouping products and customer tracking, he added. When combined with QuickBooks’ deeper inventory and accounting software, he insists it makes more sense for many businesses. In my recent interview with Square COO Keith Rabois, he said the start-up already has a set of tools for customers that is lifting sales by double digits. But he also said there’s still a lot more work being done to build out Square’s features. This is one area that competitors feel they can exploit. PayPal and Intuit are bringing a set of existing tools to bear on small businesses while VeriFone is relying on a more open approach for its SAIL mobile payment product, allowing merchants to plug in their preferred tools. The race will be on for Square to build up its offering as it goes up market before its rivals can cut it off with their own products. QuickBooks POS will start at $1,099 for a basic version of the software and $1,499 for the pro version. With hardware, the pro version costs $1,899. The pro multi-store software sells for $1,799 and $2,299 with hardware. That’s much more expensive than Square Register, which is free but requires an iPad. 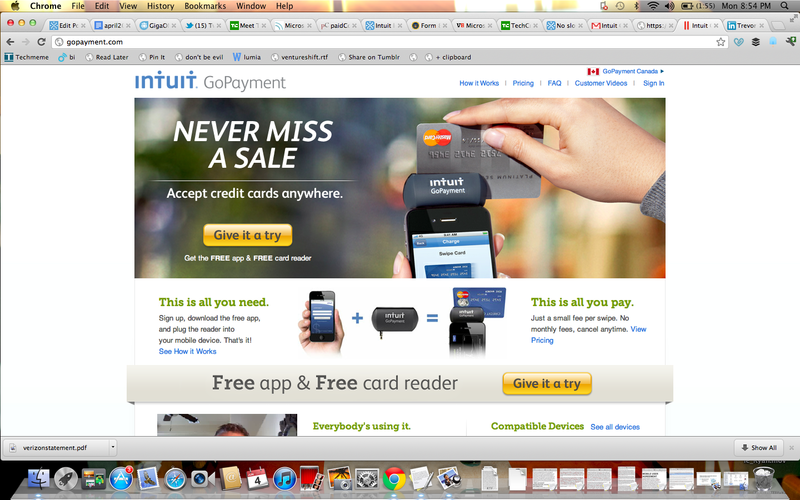 But Intuit is highlighting where the battle is going. Mobile payment is still just getting underway for many merchants and there’s a lot of room for growth for companies like Square and others on the low end. But the competition will really intensify as everyone converges on bigger merchants with more transactions. Convenience is more likely the very reason why mot of u do want an quick book. You really could have establish a great career out of this very simple tool. Why aren’t they integrating with other point of sale systems? SubtleData (www.subtledata.com) enpowers this type of integration. That would make it a much more well received offering. Great reporting Ryan! Not at all surprised by this turn of events. I am rather certain that Quickbooks POS has a major price drop in the next few months as more companies that are planning to enter into this market began to announce. By the end of the Fall of this year all players will likely discover Apple’s response. Thanks Brian. I’m curious to see if Apple jumps in like you think.